Miami-Dade Public Schools Superintendent Alberto Carvalho outlined his vision for the upcoming school year in a back to school address Tuesday morning. 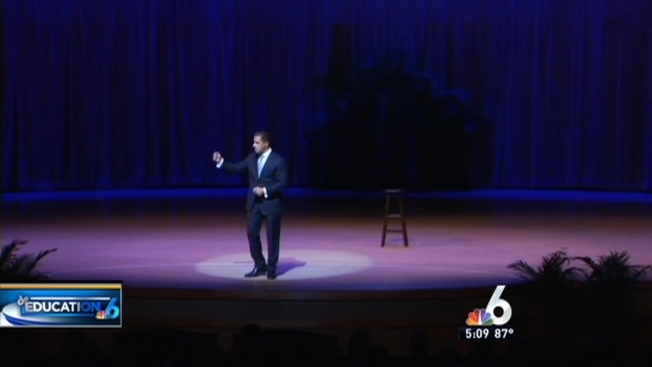 The address took place at 10 a.m. from the Adrienne Arsht Center in Miami. "It is easier to build strong children than to repair broken men, easier to build strong schools than to repair broken communities," Carvalho said in his address. Carvalho used the stage to not only motivate his staff, but also to press new initiatives. This year, he's eliminating out-of-school suspensions, and drew a big laugh when the kids from the "Breakfast Club" popped up on the screen to make his point. "Time out vacation cannot be a reward for behavior. Saving them is what we sign up for. That is what heroes do, they save everyone," Carvalho said. Instead, kids who get into trouble will be sent to so-called "Success Centers," where they'll see social workers and counselors, and teachers will keep them up to speed on their work. MDPS are set to welcome back roughly 60,000 students for the 2015/2016 school year on Monday. Last month, Carvalho detailed MDPS's new lineup of classes, programs and initiatives, describing it as "Christmas in July" and "Hanukkah in August." The expanded list of offerings for this coming school year includes 16 additional magnet programs in 12 schools and 37 choice programs in 30 schools. The list includes expanding STEM Programs, such as robotics and coding, to getting more computers into the hands of students who don't have their own, to adding more International Baccalaureate, Cambridge, Capstone and foreign language options. The district is also creating a way to help students attend far away magnet programs by initiating what it calls "Flex Stop" busing, and GPS and Wi-Fi are being added to school buses. Other new initiatives include starting a Police Explorers Program within the Miami-Dade Schools Police Department, starting a health clinic at Northwestern High, a Cyber Security Academy at Mourning High, engineering, robotics and legal studies at Rockway Middle, a forensics investigative academy at Palmetto High, and many more.